One of my dad’s patients gave him a bag of home-grown beetroots recently and this is the last of them. My mum had cooked them up a few days previously, and I used them to make a starter to supplement a green risotto. The coriander seeds add little bursts of aromatic citrus flavour and the goat’s cheese saltiness is classically lovely against sweet beets. Beat the goat’s cheese with the yogurt and creme fraiche, and a spoon of olive oil and season with salt and a touch of pepper. 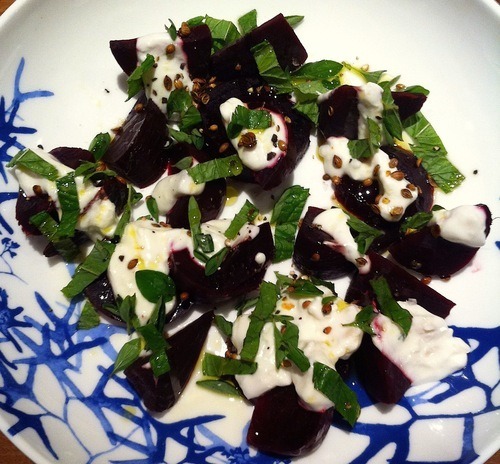 Cut up the beetroots into sizes you would wish to eat and arrange in a bowl. Drizzle over dressing, sprinkle over the coriander seeds and the herbs, and lastly, drizzle over olive oil and a pinch of salt.